Over the next few months, we’ll be inviting members of the public to take trips in our fully self-driving vehicles. Participants in our early rider program will be amongst the first to experience these fully self-driving rides, using our vehicles to commute to work, take the kids to school, or get home from a night out. According to Ars Technica, Waymo CEO John Krafcik will announce the news today during a speech he’s giving at the Web Summit in Lisbon, Portugal. And while Waymo’s news that fully autonomous cars are here is a big deal, it’s a much bigger deal that the company is officially announcing its plans to launch an autonomous taxi service in the metropolitan area of Phoenix following the testing period that’s set over the next few months. 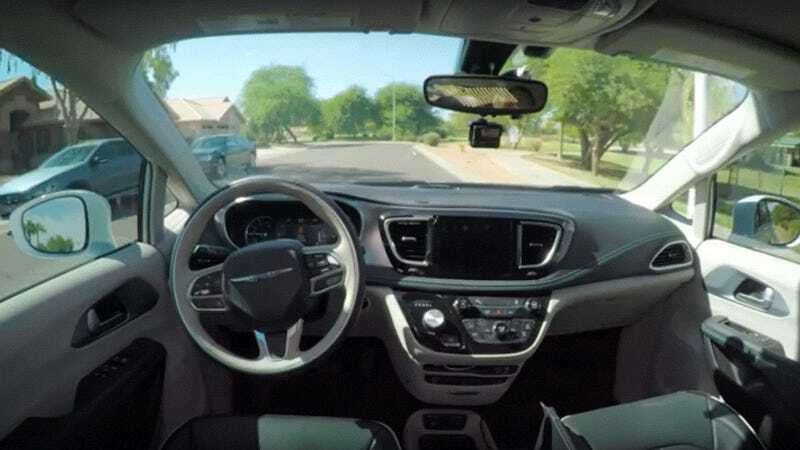 No date has been released for the launch of the commercial endeavor, but just setting a vague timetable is a change from last week when Gizmodo took a ride in one of Waymo’s self-driving Chrysler Pacifica minivans. Waymo will stick to an area around the southeastern suburb of Chandler, Ars Technica reports. From there, it will expand out. Phoenix has very consistent sunny weather and wide roads. The relatively easy-going driving conditions and lax regulatory environment have made it a great testing ground for Waymo. As its system gets more and more familiar with the area, it’ll venture out further. And another testing program was launched in Detroit in October. So, the Waymo system is also learning how to get around in some of the least forgiving conditions in the United States. It’s been about eight years since Google publicly kicked off the private sector’s race to replace the old-fashioned automobile, and its cautious approach to building a fleet of autonomous taxis appears to be paying off. And though it’ll only be rolling out one city at a time, it seems safe to say that this is the future, for better or worse.